There are multiple ways to get to the Bear front alignment. If you align in the bear from a 4-3, 4-2-5, 3-4, or 3-3-5 personnel this blitz is a possibility. 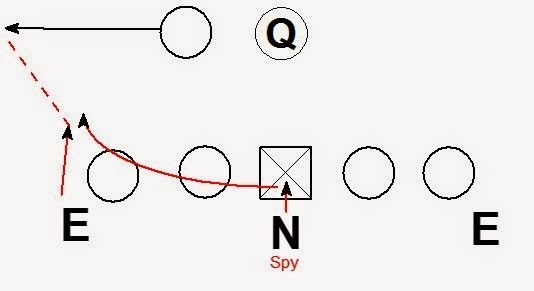 The coverage is cover zero with the defensive line accounting for the running back in coverage. Safeties - Man #2 or #3 in a 3x1 formation away from you. The Nose will get off the ball and engage the center. Once engaged the Nose should get his eyes to the running back. If the running back steps up inside, the Nose will disengage the center and man cover the back. This technique should put the Nose in great position to defend any running back screen concepts. If the running back blocks one of the blitzing linebackers the Nose becomes an extra rusher. The linebacker is an inside blitzer and will always attack the block of the running back to the inside. By attacking the inside of the running back, the linebacker will disrupt the QB's rhythm and footwork. The Nose will work to the outside of the block. The Nose must be aware of the RB chipping the linebacker before running a screen. If the back does block the Will, the Nose should be in good position to clean up the QB if the Will does not get the sack. If the running back releases, the End will handle covering him in man coverage. The Nose will go to cover the running back. As the back is picked up by the End, the Nose will replace the End as the contain rusher. Both Tackles have read technique. The DT's are getting off on the snap and attacking the guards. 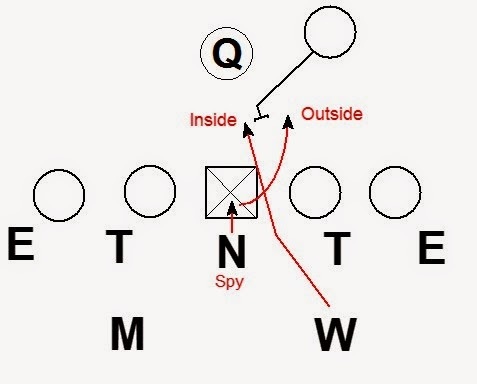 If the guard pass sets to the DT, the DT drops outside looking for a hot throw. The depth for the DT's drop is 3-5 yards. If the guard does not set to the DT, the DT continues to pass rush through the B gap. Depending on the blocking scheme one, both, or neither DT could drop. The defense is presenting 4 rushers to the right (End, Tackle, Mike, and Nose) the offense only has 3 blockers (RT, RG, Center). The extra (unblocked) rusher should force a hot throw. The right DT is reading out and should drop hot. To the left the offense has 3 blockers (LT, LG, and RB) for 3 rushers (End, Tackle, and Will). 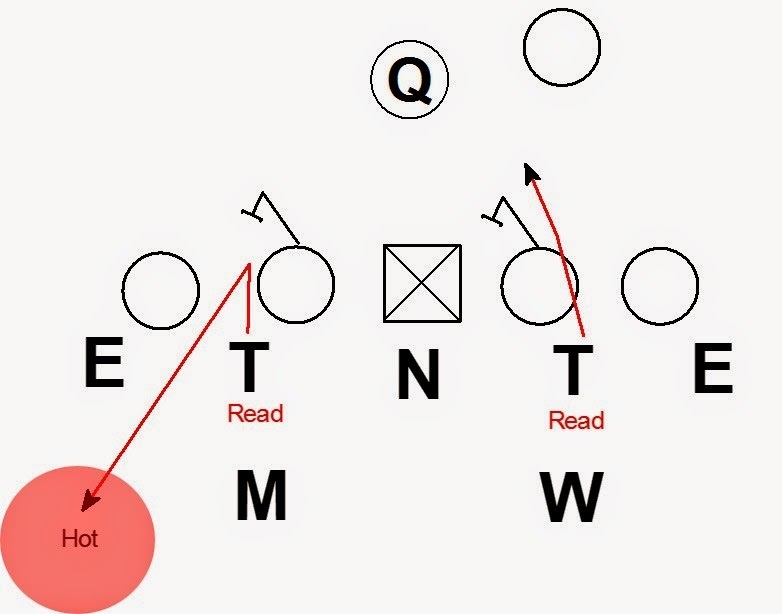 If the center attempts to create a 3 vs. 3 to the right (Center, RG, RT for End, Tackle, Mike) the defense has a 4 on 3 overload to the running back. The Will should attack the RB to the inside while the Nose works to the outside of the RB. 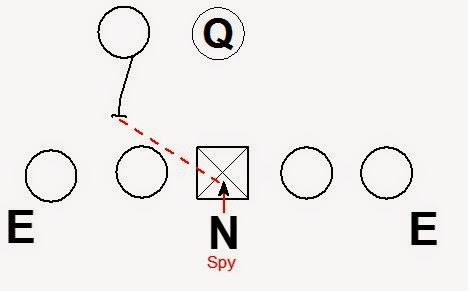 What about adjustments vs empty or 3x1 where #3 is a big blocking body and lines up behind the tackle like a sniffer. TE adjustments? We are out of a 3-4 and have the OLBs take the TE man and safety would fill C gap if open. Great stunt we use it alot. Not as detailed as this one, but I like the nose and ILB concepts. Thanks for the questions. It is easier to talk about with diagrams so here is a follow up post.